“The Apple music event of Sept. 9, 2009, marked the return of the world’s greatest corporate storyteller. For more than three decades, Apple (AAPL) co-founder and CEO Steve Jobs has raised product launches to an art form. 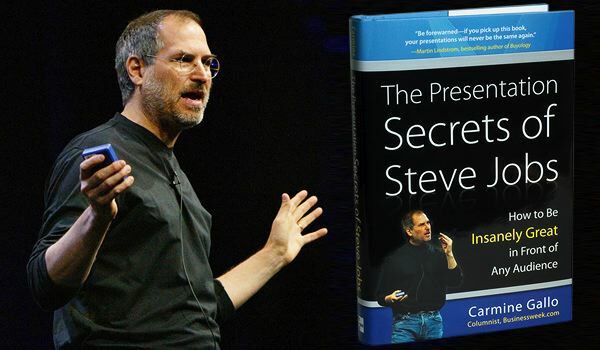 In my new book, The Presentation Secrets of Steve Jobs: How to Be Insanely Great in Front of Any Audience , I reveal the techniques that Jobs uses to create and deliver mind-blowing keynote presentations. Steve Jobs does not sell computers; he sells an experience. The same holds true for his presentations that are meant to inform, educate, and entertain. An Apple presentation has all the elements of a great theatrical production—a great script, heroes and villains, stage props, breathtaking visuals, and one moment that makes the price of admission well worth it. Here are the five elements of every Steve Jobs presentation. Incorporate these elements into your own presentations to sell your product or ideas the Steve Jobs way. 1. A headline. Steve Jobs positions every product with a headline that fits well within a 140-character Twitter post. For example, Jobs described the MacBook Air as “the world’s thinnest notebook.” That phrase appeared on his presentation slides, the Apple Web site, and Apple’s press releases at the same time. What is the one thing you want people to know about your product? This headline must be consistent in all of your marketing and presentation material. 2. A villain. In every classic story, the hero fights the villain. In 1984, the villain, according to Apple, was IBM (IBM). Before Jobs introduced the famous 1984 television ad to the Apple sales team for the first time, he told a story of how IBM was bent on dominating the computer industry. “IBM wants it all and is aiming its guns on its last obstacle to industry control: Apple.” Today, the “villain” in Apple’s narrative is played by Microsoft (MSFT). One can argue that the popular “I’m a Mac” television ads are hero/villain vignettes. This idea of conquering a shared enemy is a powerful motivator and turns customers into evangelists. 3. A simple slide. Apple products are easy to use because of the elimination of clutter. The same approach applies to the slides in a Steve Jobs presentation. They are strikingly simple, visual, and yes, devoid of bullet points. Pictures are dominant. When Jobs introduced the MacBook Air, no words could replace a photo of a hand pulling the notebook computer out of an interoffice manila envelope. Think about it this way—the average PowerPoint slide has 40 words. In some presentations, Steve Jobs has a total of seven words in 10 slides. And why are you cluttering up your slides with too many words? 5. A holy smokes moment. Every Steve Jobs presentation has one moment that neuroscientists call an “emotionally charged event.” The emotionally charged event is the equivalent of a mental post-it note that tells the brain, Remember this! For example, at Macworld 2007, Jobs could have opened the presentation by telling the audience that Apple was unveiling a new mobile phone that also played music, games, and video. Instead he built up the drama. “Today, we are introducing three revolutionary products. The first one is a widescreen iPod with touch controls. The second is a revolutionary mobile phone. And the third is a breakthrough Internet communications device…an iPod, a phone, an Internet communicator…an iPod, a phone, are you getting it? These are not three devices. This is one device!” The audience erupted in cheers because it was so unexpected, and very entertaining. By the way, the holy smokes moment on Sept. 9 had nothing to do with a product. It was Steve Jobs himself appearing onstage for the first time after undergoing a liver transplant.